Let me begin by congratulating the Russian Federation on its Presidency of the Council for June and for organizing this debate. I would like to express our appreciation for their flexibility in adjusting the date of the debate to our request. I welcome the presence of my good friend SRSG Ambassador Tadamichi Yamamoto; Under-Secretary General Vladimir Voronkov and UNODC Executive Director Yuri Fedotov here today, and we thank them for their briefings and presentations. 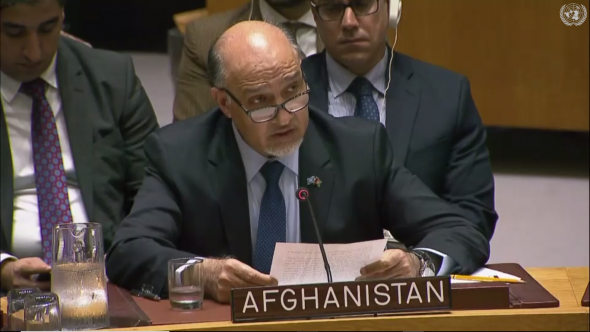 Since the last deliberation of the Council on Afghanistan, we experienced a mix of apprehensions accompanied with hope. The Taliban’s so-called spring offensive, yet again, caused more deaths and injuries throughout the country. But their attacks faced prompt, and at times, preemptive action from our national security forces and hence were futile in achieving their objectives. In contrast, we reiterated our commitment to peace and ending violence, offering the Taliban a historic chance to prove their willingness to choose a path away from conflict and destruction, with a key role played by our Islamic clerics, peace marchers and international partners. We also witnessed notable developments in the regional context, particularly with respect to Afghanistan-Pakistan cooperation. Further, international support to secure and safeguard our country against violent attacks remains high. We completed the 4th year review of our National Security Strategy at the NATO Ministerial Visit, where the security situation in Afghanistan and our reform measures were discussed. As a key outcome of the gathering, NATO partners renewed commitments to help fund our security forces for the coming years with annual financial support. In this regard, we look forward to new pledges of support at the July NATO Summit in Brussels and potential contribution of other international partners. In line with our unremitting commitment to the security of Afghanistan and the wider region, we have moved to double the size of our commando forces and strengthen our air force, which will enhance the overall capability of our national defense and security forces. Reforming our Defense and Interior ministries also remains a priority, where measures are already underway to bring to leadership positions a new generation of highly educated and capable officer corps in our defense and security institutions. This Council is well aware of our firm desire for an end to the senseless violence which has been taking scores of innocent lives each and every day. Earlier this month, the leadership of the National Unity Government took another historic and bold step to achieve lasting peace by announcing a unilateral ceasefire with the Taliban for the end of Ramadan and Eid-ul-Fitr holiday. Our announcement responded to a call by a grand gathering of around 2,500 Islamic clerics that met in Kabul from 34 provinces, which condemned acts of terror and violent extremism as contrary to Islamic tenets and principles. These developments complement our revitalized peace strategy, which was unveiled at the Kabul Process 2 Conference, and reaffirmed in Tashkent. The initiative once again demonstrated our willingness to make a difficult and selfless decision towards peace for our people. The ceasefire was mutually observed during the three days of Eid. At the expiration of this period, we extended it for an additional 10 days. Regrettably, the Taliban failed to reciprocate, and carried out terrorist attacks on a number of occasions. We thank this Council and every one of you for joining our call to the Taliban to re-engage in the ceasefire and take part in peace talks without preconditions. We appreciate efforts from within our region and beyond in helping to create a conducive environment for the ceasefire during the religious holiday. During the ceasefire, our security forces acted to defend our territorial integrity, and continued operations against elements of foreign terrorist groups, including Daesh, Al-Qaeda, among others. They played a major role in the elimination of Mullah Fazlullah, head of the TTP terrorist group. This was an important development, which reaffirms our long-standing policy of combating terrorist groups with equal measure and focus, and without any distinction. 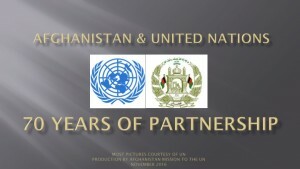 The success of the peace process will depend on a number of factors: we need to further strengthen our unity, continue to keep our people informed and involved at all stages of the process, ensure effective management of future ceasefires and potential negotiations, ensure genuine implementation of Afghanistan-Pakistan Action Plan for Peace and Solidarity; and work to further improve regional and global consensus on the international effort in Afghanistan. It is imperative that our zeal for peace should be based on the political, social and diplomatic efforts, coupled with security considerations, which should only aim to strengthen our unity and stability. We must make sure that opportunities for peace are seized, not lost or turned into new challenges. This will only be possible by ensuring that the overall outcome conforms to the wishes and expectations of all Afghans, across the full spectrum of society. To that end, ensuring transparency in all stages of the peace process and preventing any degree of misuse will remain important. It is also essential that peace efforts serve to complement and reinforce social cohesion and consensus on other national issues, including the consolidation of democracy, by virtue of forthcoming elections. Furthermore, preserving fundamental human rights, particularly of women, and ensuring justice for victims remain of paramount importance. With regards to regional cooperation, a number of high-level reciprocal visits between Kabul and Islamabad have led to a new framework in the form of the Afghanistan-Pakistan Action Plan for Peace and Solidarity. The seven agreed principles cover a number of important areas, including counter-terrorism cooperation and Pakistan’s support for an Afghan-led and Afghan-owned peace process. Pakistan’s Chief of Army Staff, General Qamar Javed Bajwa, visited Kabul on the 12th of June, and important discussions were held with Afghan leadership, focusing on the sincere, effective and timely implementation of the Action Plan, through concrete measures. Last week, a Senior Afghan delegation visited Islamabad again, to generate positive momentum on the Action Plan for Peace and Solidarity. The framework has the conceptual ingredients to shift dynamics towards greater trust, confidence and mutual cooperation, but an agreement is only as good as the will to implement it. And we, for our part, cannot overstate our commitment to its terms in letter and spirit and expect Pakistan to do the same. In the broader context, we have expanded dialogue for greater cooperation with a number of countries – including those in our immediate region, as well as our Central Asian partners. The past three months have also witnessed developments which we hope will strengthen regional consensus in support of the joint strategy of Afghanistan and our international partners. To that end, we wish to reaffirm our overriding commitment to ensuring Afghanistan’s centrality as a platform for cordiality and win-win cooperation for all. Earlier this month, President Ghani attended the Shanghai Cooperation Organization Summit in Qingdao, China. Together with SCO member and observer states, we reiterated our position that expanding regional connectivity and overcoming the nexus of transnational crime and terrorism are fundamental for stability and prosperity in the wider region. With the revitalized SCO-Afghanistan Contact Group, we look forward to increased cooperation with that important forum. Four months from now, we are scheduled to hold our parliamentary and district council elections. Preparations are underway for these, along with presidential elections next year. So far, more than 7.3 million citizens have registered to vote, demonstrating their firm conviction that democracy, pluralism, and the rule of law are the bedrock of our stable future. Our hope and expectation is to ensure that these elections will be transparent, credible, and inclusive, in accordance with our people’s demands. We are pleased that a number of young talented figures have stepped up as candidates. To that end, reform measures are underway in the Independent Electoral Commission and Electoral Complaints Commission. Moreover, a list of new nominees for the position of Chief of the IEC Secretariat, was presented to the leadership for consideration and approval. Ensuring security for the elections is another important priority, and I am pleased to inform that comprehensive security arrangements have been put in place for this purpose. As a final note on this issue, we reiterate that the successful completion of the electoral processes is of vital importance for our unity and political stability. 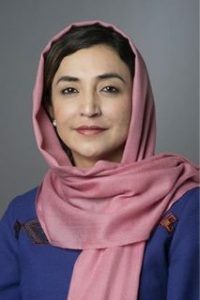 The next main international event in the political calendar concerns the Ministerial Conference on Afghanistan, which will be jointly hosted by Afghanistan and the United Nations in Geneva in November. We look forward to presenting the highlights of progress against key benchmarks from the Brussels Conference, based on our National Peace and Development Framework. These include progress in the areas of governance, public sector reform, local governance, economic growth, and promoting and protecting human rights. We look to international partners to recommit new support over the coming years for our stability and prosperity. We look forward to high-level participation from our regional and international partners. The Conference comes at an important time, where the level of regional and international consensus on Afghanistan, particularly on the imperative of peace, is at its highest point since 2001. Looking ahead, we will remain focused on other pressing priorities, such as the looming effects of the drought, with prospect of displacing half a million people. This situation warrants immediate international attention. I strongly call upon the international community to fully fund Afghanistan’s Humanitarian Response Plan covering 2018-2021. We thank UNHCR, OCHA, and other UN agencies for their tireless efforts on the ground and call on the broader donor community to join the relief efforts. By the same token, we will remain engaged in implementing our national strategy to address the lingering problem of narcotics, in all its aspects. We hope to do so with a greater degree of collaboration with regional and international partners. This year, we continued to work on multiple fronts to combat this threat as a key priority in the work of the National Unity Government. This included eradication, law enforcement and alternative livelihood measures. In the first 6 months alone, our counter-narcotics police force carried out 1,688 operations nationwide, seizing over 112,500 tons of illicit drugs and destroying a significant number of drug processing laboratories. We hope to witness more tangible progress in this effort, which is only possible with greater cooperation among regional and international actors, including in curtailing driving factors such as the trafficking of precursors and reducing demand. We appreciate UNODC’s support role in this effort, and thank the Executive Director for leading the agencies’ work in Afghanistan. We are looking to the future with a degree of optimism, in light of recent developments concerning our peace efforts, including the announcement of the cease-fire, and a possible shift in regional dynamics in support of peace. Moreover, our progress towards economic integration in the wider region, through various mega economic and infrastructure projects continues unabated in a positive trajectory. The institutional reforms will remain a key component of our strategy for the promotion of the rule of law and our stability. In the broader perspective, we believe these gains can best be solidified in an atmosphere in which all partners work together, in unison and cooperation for a strategic objective that is vital to us all.